I came across this trash on Tuesday afternoon. I opened up the pack in front and saw some vintage cameras. I hadn’t gone far so I took the bag, brought it home and continued my mission, finding nothing else of interest. 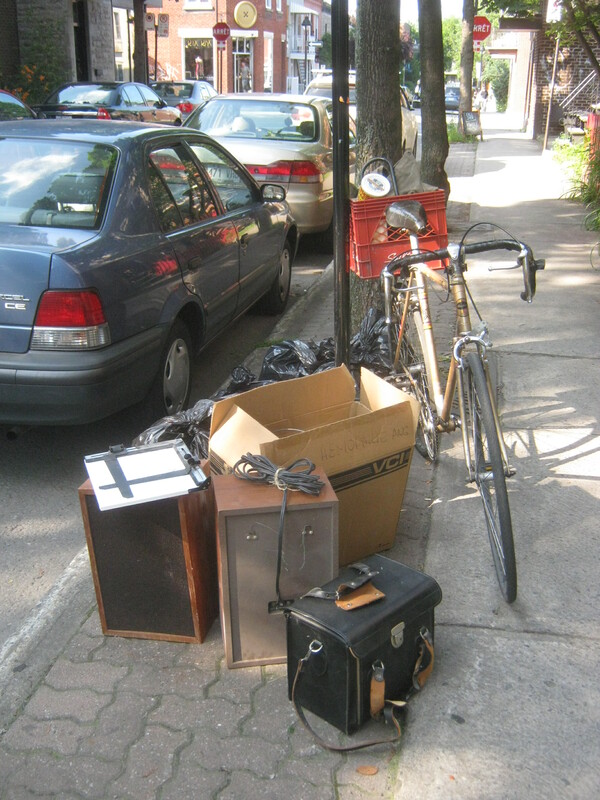 When returned later I found that the speakers and the box (which contained some bric-a-brac, I don’t remember what exactly now) were gone as well. I had probably come at exactly the right time, before some passerby walked by and took it for themselves. 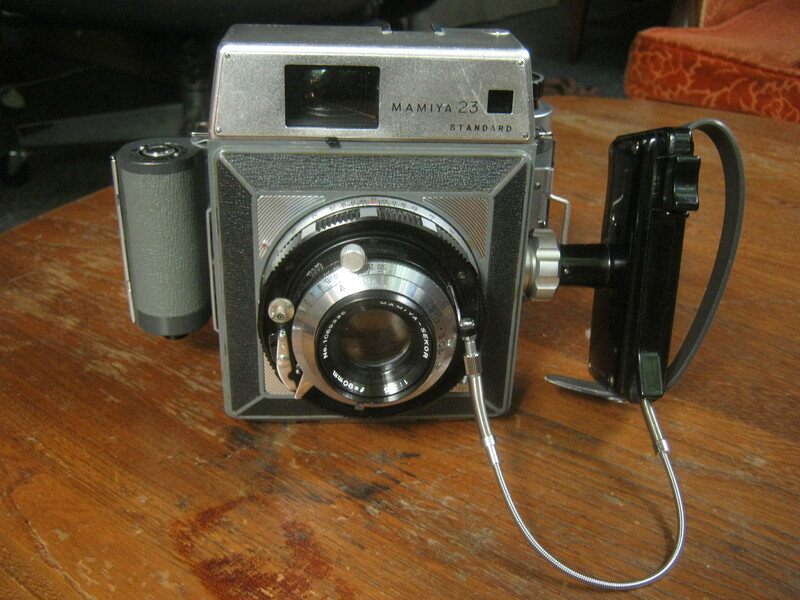 This camera, a Mamiya 23, was definitely the most valuable. Including the accessories I also found in the bag it should sell for between 300-400 bucks. Here’s a link to other cameras of this make on Ebay. I’ll need to test it out but given its excellent cosmetic condition it probably works fine. If all goes well it could be one of my best finds in terms of monetary value of the year! 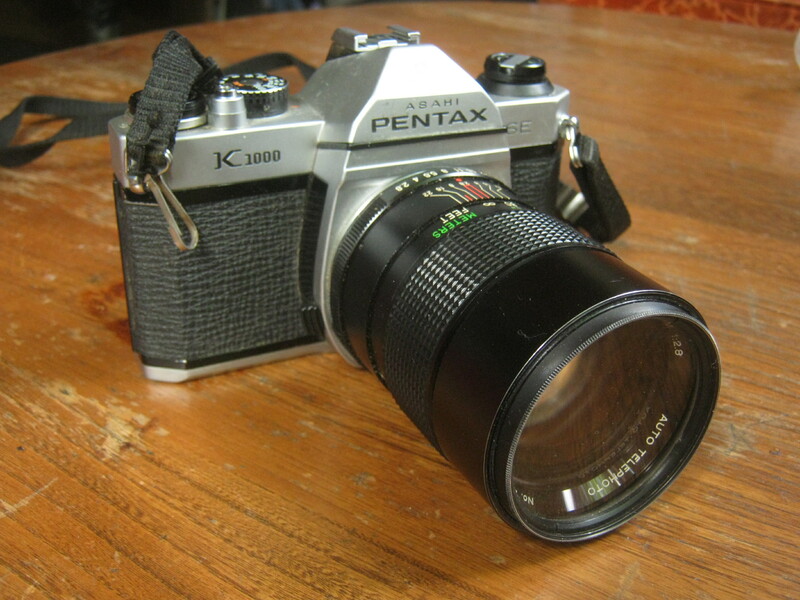 This Pentax K-1000 isn’t quite as valuable but should still net me around 50$ on Ebay, assuming that it works of course. It’s also quite clean, however, so I’m pretty confident that it does. 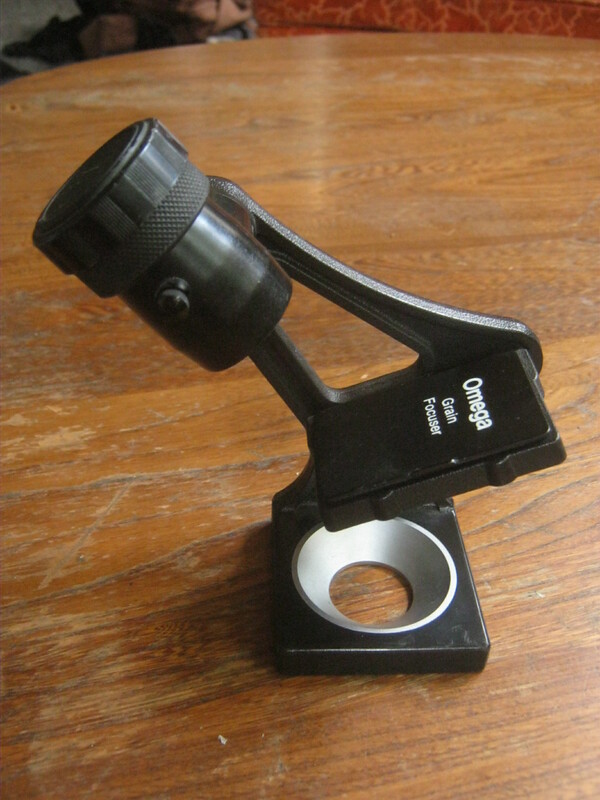 I also found this Omega Grain Focuser. I don’t know what it does exactly, beyond being of use in a darkroom, but they seem to go for a decent price on Ebay. I put it up for 95$, we’ll see if anyone bites. I think whoever threw this out decided to move on from their darkroom / film photography days. In one of the black bags there was more darkroom equipment such as clothes-pins, empty vials, and another (broken) focuser thing. The fact that the cameras were left out in the open makes me think that they wanted them to be seen and taken home, though I doubt they knew exactly how much value they still have. A lot of people assume that old things (especially technology) aren’t particularly valuable. However, they can hold on to a lot of value, especially if they were high quality pieces to start. Hopefully these cameras work as I expect them to, altogether they represents my monthly rent and a bit on top. I don’t know much about film photography but my room-mate does, she can show me the ropes and help me test them. In other news, I forgot to mention that I finally had a little yard sale on Sunday. It was pretty successful. I made around 90 bucks, unloaded a fair bit of stuff, hung out with friends and met some cool people. I sold a lot of my ephemera (old written/printed papers) to someone who runs a local archive, which is sort of ideal as the items will be more accessible to the general public. I may also be able to sell some of my ephemera to the same person going forward. I should have taken a picture of the sale come to think of it. Ah well, I plan to have another soon, possibly as soon as this weekend! Ebay sales have also been good. I spent a bit of yesterday listing things on Ebay and a lot of three glasses, which I found in Outremont and talked about in this post, sold almost immediately for 55$. I also finally sold that textbook I was talking about for 52$. I think I’m getting better at maximizing my Ebay profit. I’m going out soon to check out the West Plateau. I hope to find some more valuables! The Mamiya is a beaut! I used to want a large film camera like that; almost a professional camera. recently i ran accross a bunch of different cargo bikes (pictures), and thought of you. wondered if you’ve ever consdered getting same? sure can hall a whack of stuff with those. That mamiya will net you big time,this is a great camera.I want it.